Essential oils are derived from plants or citrus fruits from their leaves, stems, needles, flowers, bark, roots, or other aromatic plant parts through the process of hydro or steam distillation, or cold pressed. The oils are highly concentrated and only a little is needed. Essential oils are highly beneficial and effective when used appropriately. However, improper use can be harmful. 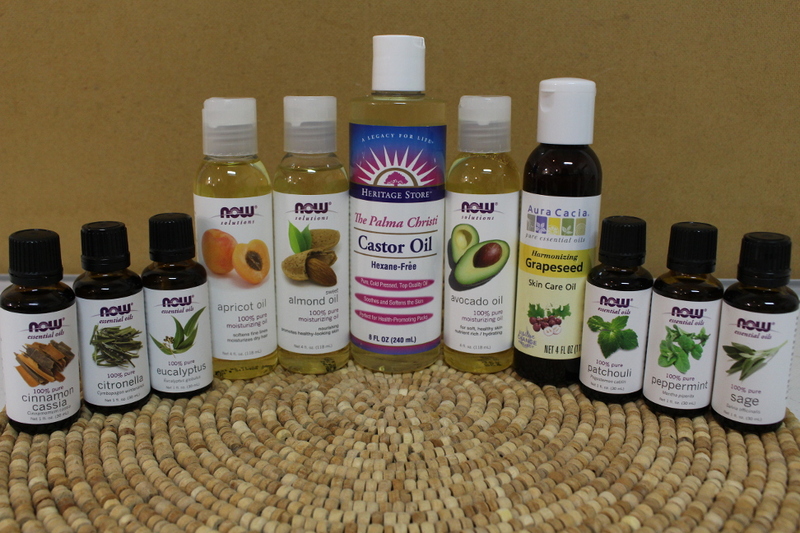 Essential oils can be used by themselves or with a carrier oil such as grape seed oil, coconut oil, almond oil, etc. We carry a wide variety of essential oil's including your favorite such as peppermint, eucalyptus, patchouli, sage, cinnamon, lemongrass, frankincense, Neroli, lavender, grapefruit, ylang ylang, lemon, citronella, as well as many pre-blended oils for your convenience. Did you know that you can make your own deodorants, soaps, bath salts, cleaning products, pest repellents, and more using essential oils? Come in to smell our oil testers to see which one is your favorite.